Western-style hotels or Ryokans – traditional Japanese inns? When you enter the rooms in these ryokans, you remove your shoes in a small ante-room and put on the slippers provided. 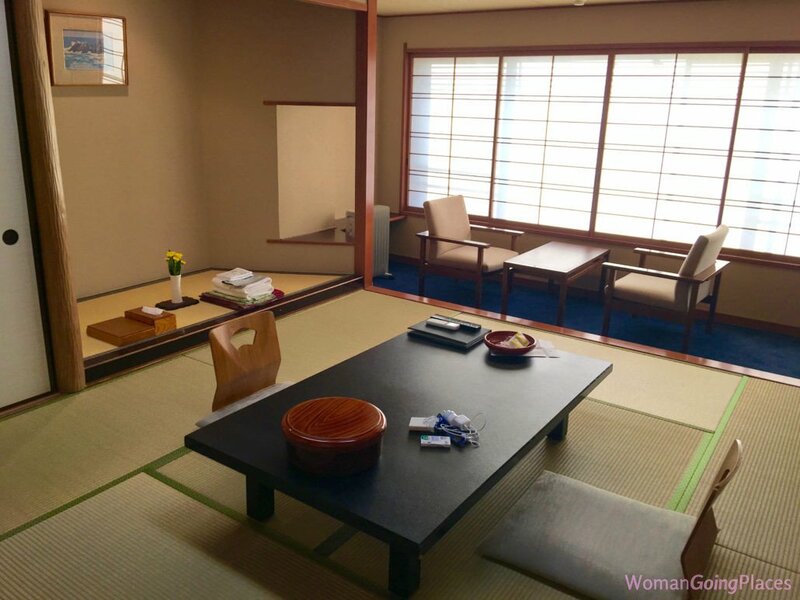 Tatami or densely woven straw mats cover the floors. The sliding doors (shoji screens) and windows are made of wood and paper. The rooms are usually spacious and light with minimal furnishings. An atmosphere of serenity seems to emanate from them. There is always a low wooden table with legless seats and cushions or just the cushions for seating. Often rooms have an alcove attached in which stand comfortable low armchairs. When you first enter the room, there will be no bed or mattresses on the floor. 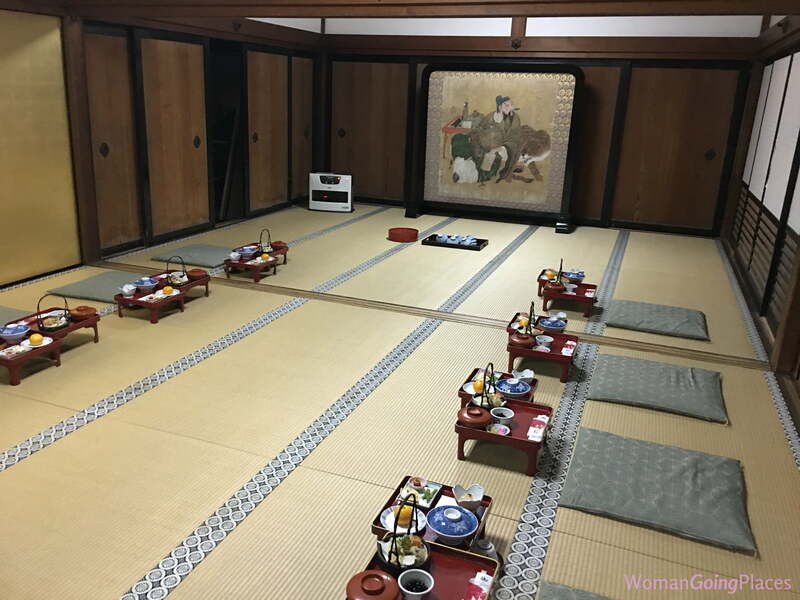 It is only while you are having dinner in the dining room of the ryokan that staff come, move the table aside and set up futons with quilts on the floor. You can always ask for an extra futon if you want more cushioning between you and the floor. Pillows often have something in them that feels like small beans which adjust to the shape of your head, but are not particularly comfortable. All rooms have kettles or thermoses with hot water, a teapot and cups and supplies of Japanese green tea. Every implement is beautifully presented. Most ryokans have en suite toilets and showers but it’s worthwhile to check before you book. One of the most comfortable ryokan we stayed in was on Miyajima island, just across the strait from Hiroshima. The best rooms in the Miyarikyu Ryokan have views looking out to the sea and the sunset. You can watch the wild deer of the island wandering undisturbed on the street below. While the rooms in the ryokans are very clean and simple, the food can vary from quite basic to outstanding. The better ryokans provide breakfast buffets with a wide array of both Japanese and Western food. It’s worth trying the Kaiseki-style dinners at least once in the best ryokans. These are banquet-like meals in which a seemingly endless series of courses arrive of local delicacies and the best the chef can offer. When staying in ryokans or hotels in Japan, you do not need to bring pyjamas. Sleepwear, usually a yukata – a unisex cotton kimono – is provided, as are toothbrushes, toothpaste, shampoos and generally razors and hairbrushes too. It is particularly pleasant to put on a yukata which often has attractive patterns and colours. A traditional jacket is also provided to wear over the yukata. The yukatas serve both as pyjamas and leisure wear. It is perfectly acceptable to wear the yukata to breakfast and dinner in the dining room, where everyone else will also be wearing the same yukata. There is a very strict rule governing how you put on the yukata. You must always fold the right half against your body and then fold the left side over it so that it is on top and then tie it with an obi – a beautiful wide band. Folding the opposite way with the right on top is frowned upon as it is the way Japanese dress the dead. Even less sophisticated ryokans provide a very good level of comfort. We spent one night in a shukubo, the guest lodging of Shojoshin-in, a Buddhist temple monastery in Koya-san. Koya-San is situated in forested mountains south of Kyoto. It is the world headquarters of the Shingon School of Buddhism whose founder in 816 was Kobo Daishi, one of the most important religious figures in Japan, who is said to be buried in Koya-san. The town has 110 temples and is a magnet for pilgrims. Which is probably why when we arrived at this remote spot after taking several trains and a funicular up the 650 metres to get there, we were stuck in a traffic jam in the town centre. There are many shukubo of varying degrees of comfort available in Koya-San for pilgrims and visitors. Many are listed on the Koyasan Shukubo Association website. We assumed that the monastery would be quite austere, but were surprised to find the traditional style rooms comfortable, with heating, facilities for tea, wifi and a TV. Dinner was a strictly vegetarian meal with no meat, fish, garlic or onions according with their strictures – but sake was served with dinner on request. Although Western toilets were available, all toilet and bathroom facilities are shared and not en suite. Most ryokans in Japan have onsen, varying from small and basic, as in the above shukubo, to elaborate and luxurious with a large choice of pools and optional features such as massage and treatments. We highly recommend staying at least once in a ryokan as part of a memorable Japanese experience.